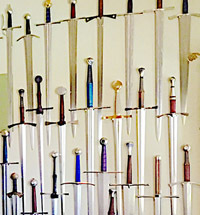 Albion Armorers have a solid reputation among medieval sword enthusiasts for the amount of research they do on museum originals in an attempt to create a replica that is as close in handling, weight and overall style and appearance as possible. While the methods they use to actually create the blades may be modern, and the price tags of their blades may be prohibitively expensive to many, in this hands on review we will take a closer look at "what to expect" from an Albion sword. 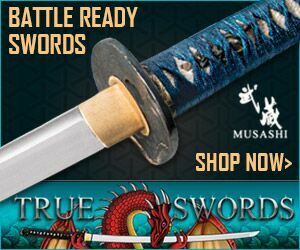 And try to determine if - and why - they are usually at least 2-3 times more expensive than the swords that we tend focus on here at SBG. I've been waiting for this sword for quite a long while. 16 weeks in fact. This sword represents my first "higher tier" sword purchase. The Ritter interested me primarily because, prior to stumbling upon myarmoury and being introduced to Albion swords, I had never seen a sword like this. 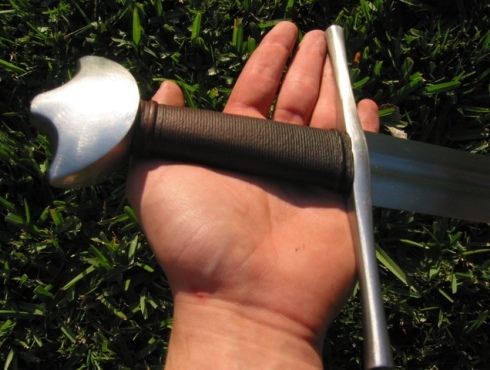 The cocked hat pommel (Oakeshott type D) has never been one of history's favorites and certainly has not made its place in many of today's popular films, games, or other means of portrayal of swords. That said, I cannot help admiring a company that takes risks like the making of such an obscure sword and offering it to people like me who are interested. So after many weeks of ogling, saving money (with the resolve to buy a high end sword), and pacing back in forth over which sword I'd like, I finally decided to go with this little obscurity. This sword is probably dated between 1150 and 1250 and is of German origin. I finally received this sword today. I couldn't wait to open up the box. The sword came sandwiched in two places between black foam so that it was insulated against outside blows from the evil ups men. Not that I can complain, the box was in perfect condition, so they aren't as evil as they sometimes are. I found this sword to be superb in terms of handling, for the most part. It was an all out powerhouse with a very blade-oriented center of balance. 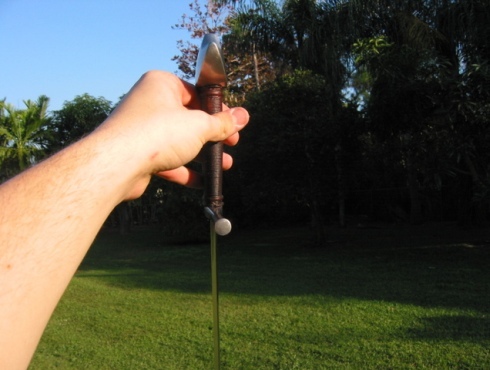 This balance leads to an almost "heavy" feel to the sword, even though it is relatively light at 2.5 lbs. This heaviness is needed because these type XI blades were meant for large downward swinging strokes from horseback. This extra weight near the center of percussion creates a very dangerous momentum that builds up from the combined blade-heftiness and swinging of the sword. 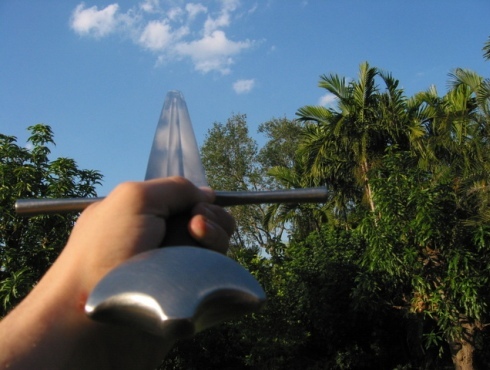 The sword is capable of some very decisive cleaving strikes which could most likely shear through maille and cloth to reach the soft, fleshy parts beneath. 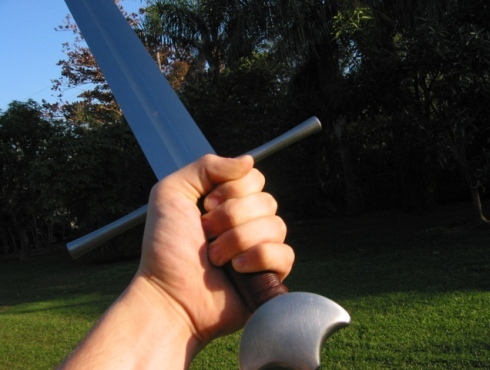 I picked up one of my shields and began some foot combat drills with this sword. I was not expecting the sword to function as well as it did outside of its equestrian habitat. 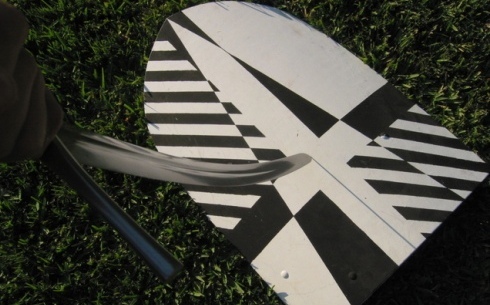 The blade moves flexibly from guard to thrust to slash to guard to slash etc. I did fond that the sword was a bit strenuous on the wrists, however, and strong arms are my best advice for fighting effectively with this weapon. As usual, I perform my flex test. This time however, I decided to do it against the shield rather than my perilous grass which is filled with noisome limestone rocks. It didn't wish to maul the blade up too badly in its early life. All I can say is this is a very stiff blade. Although not thrust oriented, I can safely say that this sword should have no problem passing through a padded garment and just maybe some light armor. I'd still greatly prefer a cutting movement to a thrusting one on this sword. Albion has received high praise throughout the sword community for their elegance in their work. That said, the Ritter is most certainly no exception. After long and hard inspection, I was forced to concluded that I found only 3 things of interest, all of them minor micrometer pittings, and all of which were virtually undetectable by the eye. I'm not going to subtract from that, simply because I had to look for some time before I could find anything wrong with its finish. The oxblood handle varies from black to brown to red depending on the sunlight and/or other lighting. The peening is indistinguishable from the beautifully executed pommel. The tip is even and spatulate with no flaws of any kind. 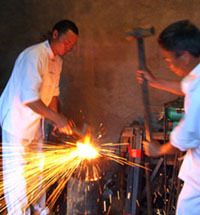 The entire sword blade is sharp and the sharpness factor did not vary from any part. The fuller is straight and even with zero deviation and ends gradually at around 2/3 the length. This sword is not rattly at all. the Ritter is as solid as a rock. The hilt furniture grips the tang very well. 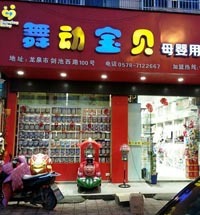 Everything is wonderfully evened out and there is no shoddy workmanship here! Admittedly I have been timid in performing and tests the involve blade contact, however I have sheared the twigs in leaves off of many a tree with no markings on the sword. 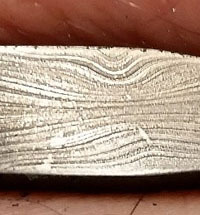 I attribute this to the swords flattened oval cross section that makes for a vicious cut. 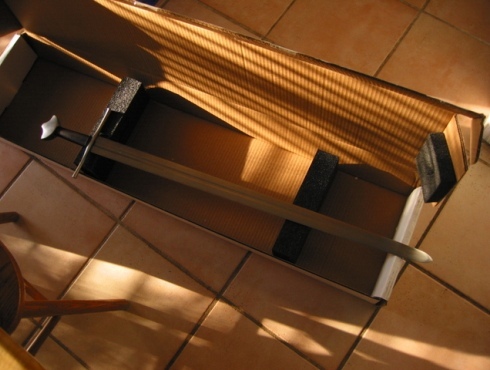 During dry handling the I can find no faults in the sword whatsoever that pertain to how well it is built. 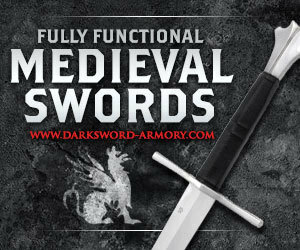 Simply put, this sword is a tank with the beauty and elegance of a true historical replica. I can't make up my mind about value for money. Usually, this is an easy task, but I find myself wobbling here. 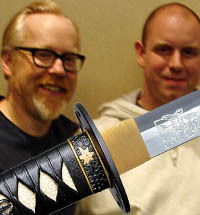 When it all comes down to it, it is whether or not you like this particular type of sword or not. That is up to you. I liked this sword a lot, however $850 is quite a lot of money. I'm not sure whether or not this is an acceptable amount (or unacceptable) for OTHERS however. I can safely recommend the Ritter to anyone whose interest ranged from the crusades to the Teutonic campaigns in Lithuania and Prussia. 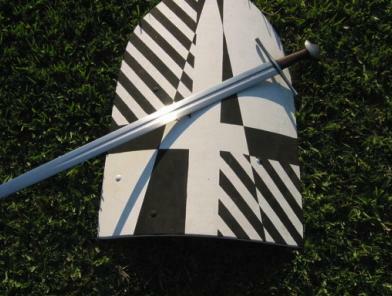 This sword does have a Germanic flavor that may turn some people off due to its lack of versatility in period costumes. It is a pretty specific niche. However this sword fills this niche amazingly. 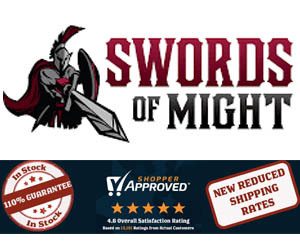 I can think of no other company that offers such a wonderful example of this style of sword. The handling is, simply put, what a true medieval replica should be. One is hard pressed to find ANYTHING scathing to say about Albion's masterpiece. Without a doubt, I would not hesitate for one moment about purchasing this sword again. In 20/20 hindsight, this may have been one of my best purchases. I am not sure if it is really worth the $700 I paid (it is now $800 due to the recent price increase), but I truly have no qualms with it. 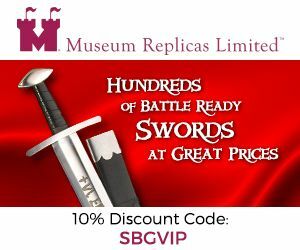 There are not many places stocking Albion Swords, so there isn't much in the way of price competition. 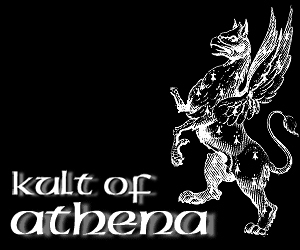 However, you can usually find the best prices on Albion swords here at Kult of Athena, where the Ritter is US$855 (instead of $880 at Albion), and quite often they do have some swords in stock and good to go - so there isn't the 3 month wait you normally have when ordering one which is a nice bonus. 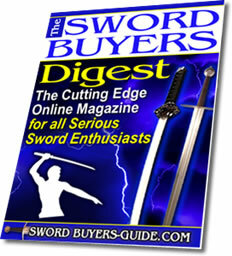 (c) Sword Buyers Guide.com 2005-2014. All Rights Reserved.